Exterior house colors combinations – only in our photo gallery! We suggest to familiarize with the most various variants which are actual today for furnish of apartment high-rise buildings, private houses, public buildings and the most different constructions. In this short review we will talk about the compatibility of colors – what colors to choose for the house, so that it looks aesthetically attractive and harmonious. If you do not know which color solution to give preference, just combine two colors, different from each other with one or two shades on the color wheel. If the house consists of elements of cold texture (for example, slate or concrete), then the most successful option will be some very bright color – for example, orange. 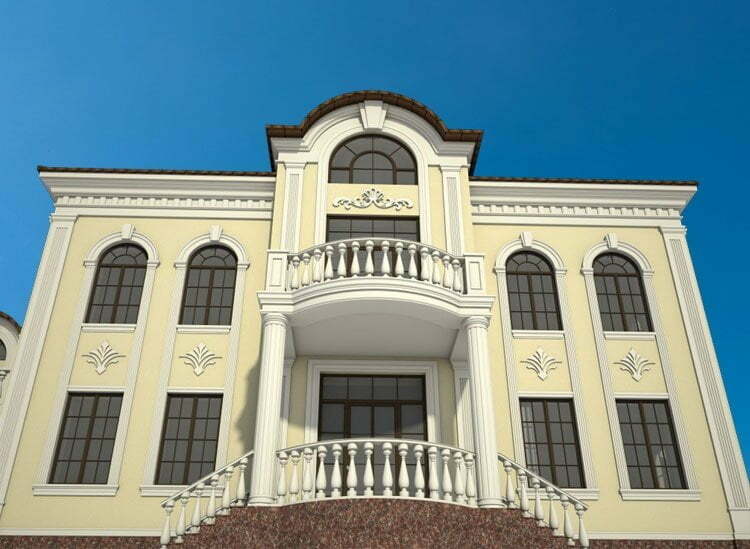 Monophonic facades are best diluted with white pediments or with an expressive brown color. Interesting architectural forms (socles, bay windows, canopies) are best highlighted with bright colors on the background of a monophonic facade. And now let’s move on to more concrete recommendations for painting the facade of the house. One of the most fashionable colors of the past and this season is sage. Sage coloring perfectly combines both with dark monochrome colors, and with brighter colors – for example, with red or blue Navy. The color of the facade of a house with a gray roof is best performed in monochrome versions or to trust the long-proven white. Some elements can be distinguished by different shades of the same color. 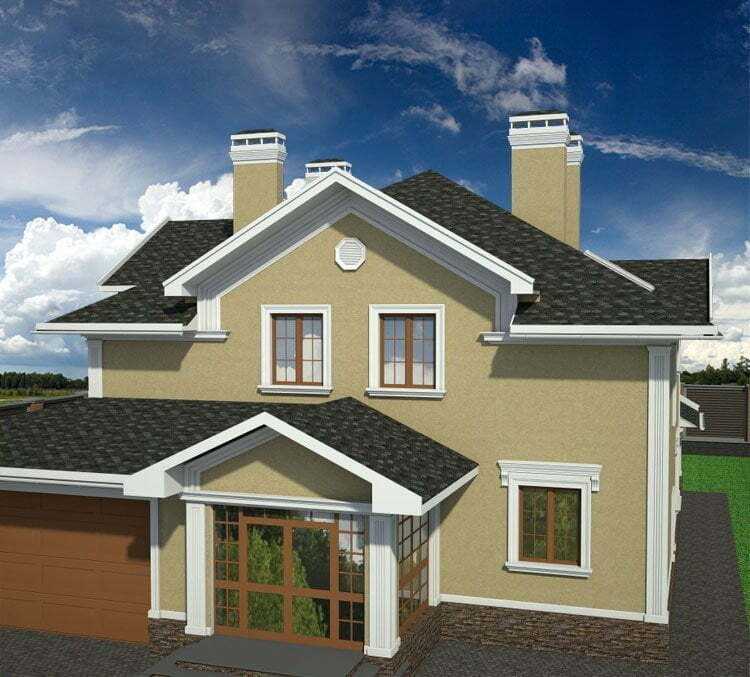 The color of the facade of the house with a brown roof should be chosen in the same earthy shade. The ideal option will be dark gray, which is very popular this season. Not bad look on the background of a brown roof beige shades. The color of the facade of a house with a red roof is best done with classic white. This original combination allows you to make the house on one side bright and contrast, on the other hand very harmonious. Fashionable colors of the facades of houses this season – olive, turquoise, yellow and even black. All of them have their own interesting features of compatibility, mainly with white, gray, brown hues. Sometimes there are original houses, where several bright colors are used in the facade coloration. Such colorful buildings look very fun. It is not for nothing that it is considered that a private house, like a person, should be beautiful not only inside, but also outside. Thus, a harmonious color solution and properly selected materials have a big weight in how the building will be perceived. 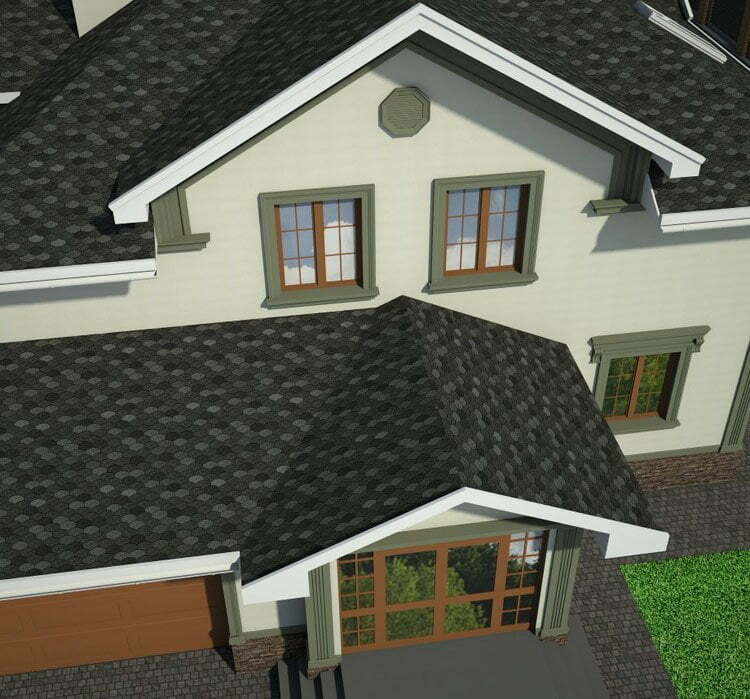 The correct choice of the color solution for both the facade and the roof determines the overall look of the house as a whole, making it more cozy and welcoming or reliable and unassailable for others. 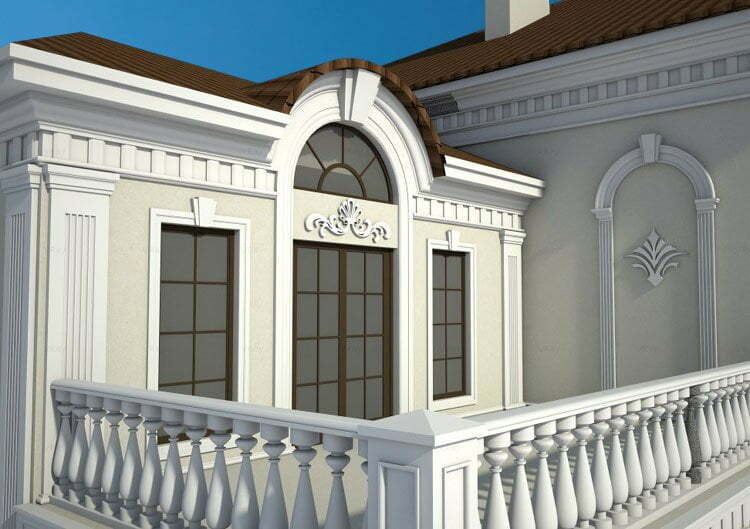 According to the technological features of the construction process the facade is finished immediately after the completion of the work on the construction of the roof. The roof will serve its owners for many years, but the facades can be changed every 5-7 years. It should also be taken into account that the color palette of colors in which materials for facades of private houses are presented are presented in the modern market in a rather rich assortment, while for roofing materials this diversity is not so great. 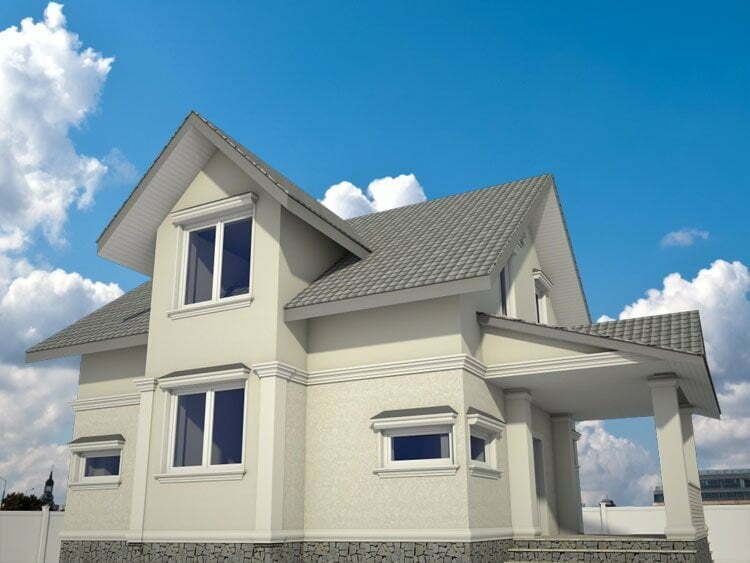 Thus, we see that first you need to choose the material for the roof and its color solution. 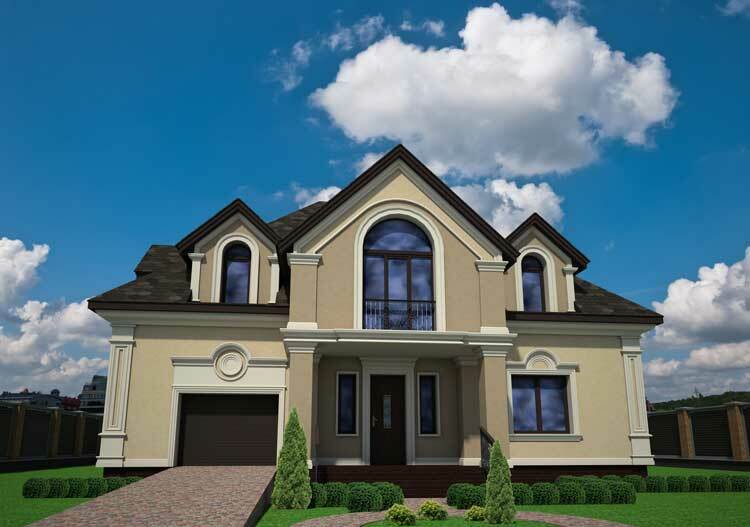 What will be the color of the facade of the house with a brown roof? 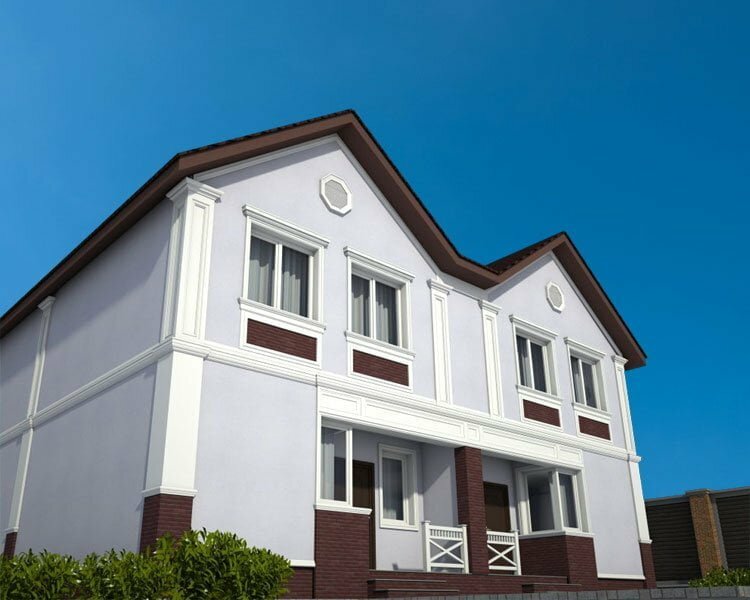 Finally, to determine how to successfully choose a combination of colors in the exterior decoration of the house, is quite a difficult task. The final result is influenced by many factors: the compatibility of color shades, the location of the house or the features of architectural solutions. Today, we finally decide how to choose the right color for the facade of a house with a brown roof, considering all possible options. By itself, brown color is a symbol of stability, loyalty and reliability. In psychology, it is considered a color of comfort and safety. This color is often used in the design of interiors, making them more solid, and also has to create a home. Roofs made in brown color are found most often, whether it is a large mansion or a small family house by the lake. In the process of construction, the question often arises – what color should the house be painted if the roof is brown? It is amazing how the combination of colors for painting the facade of the house in this case is represented by a large number of variations. The ideal addition to brown is primarily the pastel colors, creating a softer and more casual appearance. More interesting combinations will be blue and turquoise, which will bring a sense of brightness and freshness to the overall picture of the house. Soft pink color is suitable for lovers of gentle color combinations. 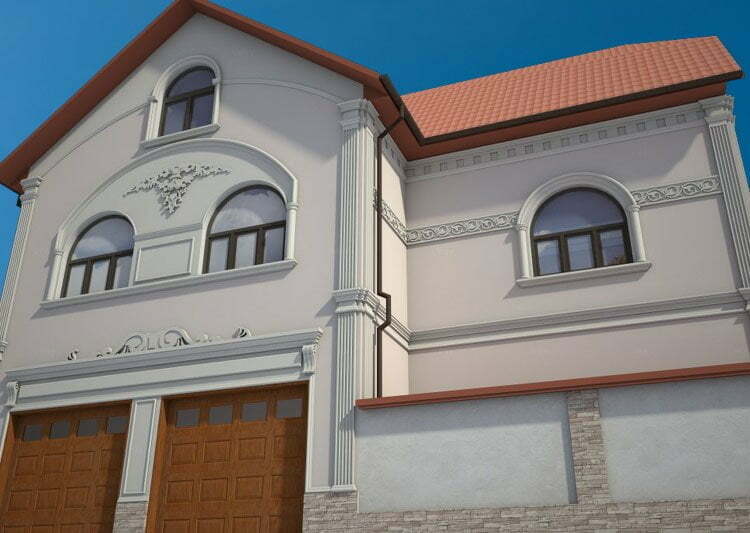 Asking the question “In which color should I paint the facade of the house?”, It is important not to dwell on one single color solution, because the facets themselves are a lot of components that can be decorated differently. 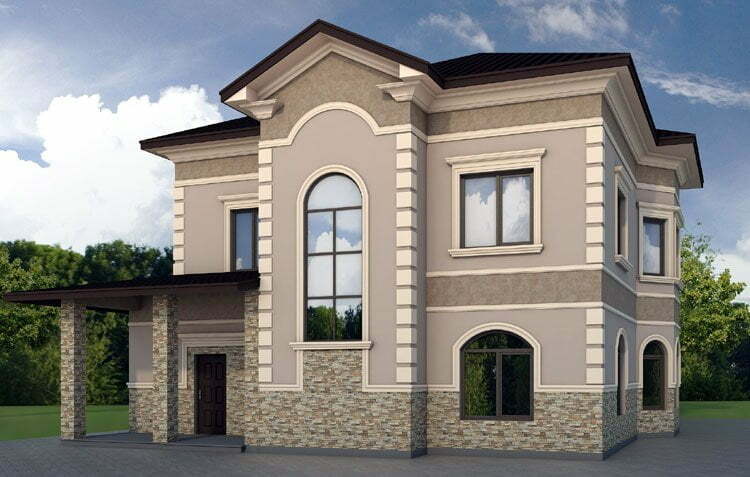 So, for example, on various photo combinations of colors of the facade of the house, we see that white steps and window frames will be combined in a harmonious way with the brown roof. Classic black and white colors are also a good solution, but do not abuse them. 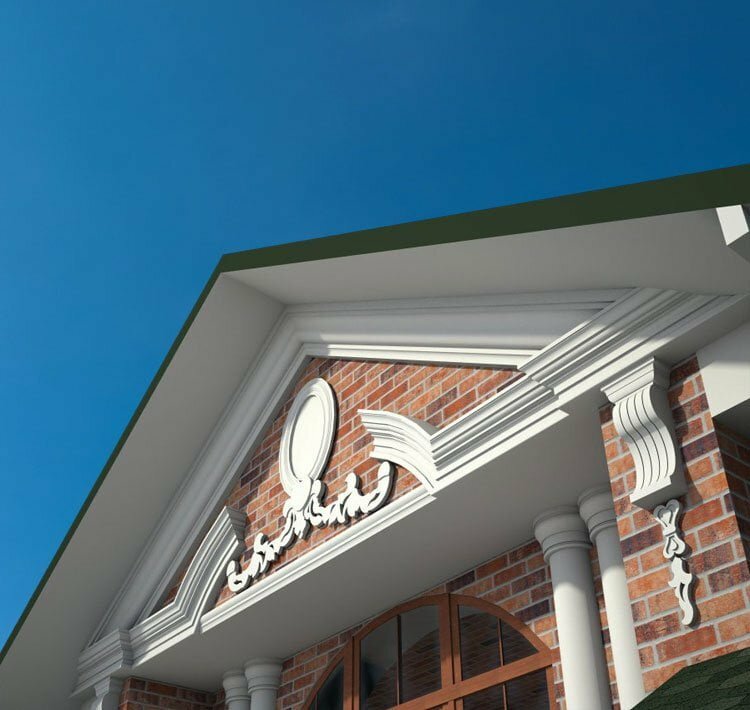 The roof of the house is not only a means that protects from bad weather, but also an important element of the decor of the entire building and even the whole residential area. 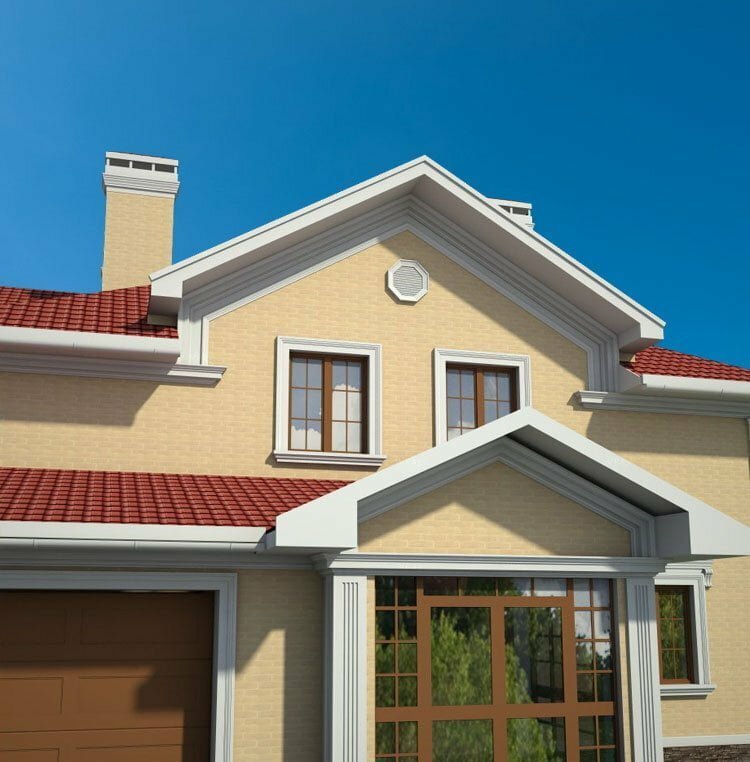 To ensure that the roof of the house is ideally combined with the design of the facade, you must carefully choose the main color palette and correctly combine all the variations of colors, as well as their shades. But first of all, in order to make the overall appearance of the house harmoniously fit into the surrounding landscape, colors should be chosen based on where the building is located – whether it is forest, mountains or the sea shore. To make the finished result pleasantly impressive after the construction, it is necessary to prepare a plan in advance, which will be considered, what combination of colors for painting the facade of the house and the roof will be the most successful. Of course, the owner himself decides, to think it over mentally, then transferring everything to paper, or to seek help from specialists of this business who will professionally select both the material for the trickery and a harmonious combination of colors. In addition, modern technology can also create a digital model of the future home, which will easily match the color of the facade of the house and the roof. In what color should I paint the facade of the house with a green roof? Green is a fairly common color option for blood. For each person at a subconscious level, this color indicates the desire for development and harmony in nature. Color symbolizes green grass, which begins to please us after a long, cold and colorless winter. 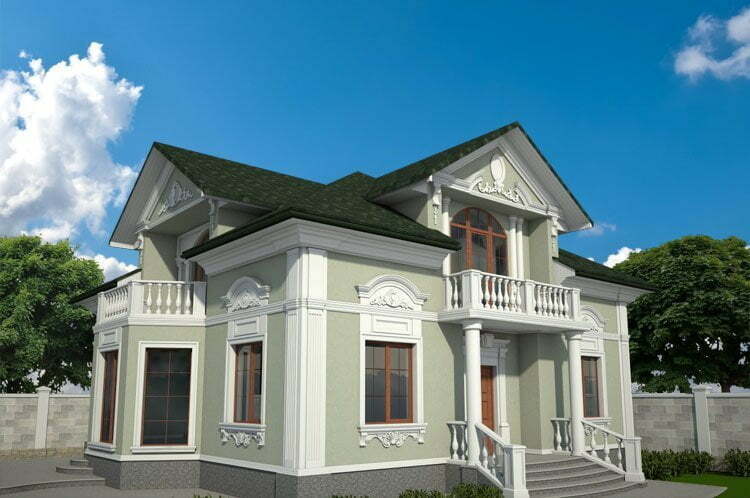 The green color of the roof of the house gives more freedom of choice, because this color is quite easy to combine. Of course, there are exceptions. The least successful combinations will be green and dark blue or turquoise hues, it is also not necessary to decorate the facade in one tone with the roof. People who appreciate originality can easily choose bright colors, right up to red. In most cases, the facade uses colors that are related to nature – yellow, brown, pastel. These color solutions perfectly complement each other. So, for example, a house with yellow walls, which is complemented by windows and doors with dark colors, looks particularly cozy and presentable. In the photo, the combination of colors of the facade of the house looks quite diverse. However, we see that most often there are facades of white and gray colors. White is absolutely neutral, it can be combined with all colors. Gray – this is a great background for the brighter elements of the building. Both these colors in combination with the green roof are a pretty harmonious option. Often the question arises: “What color of the roof should I choose for a wooden house?”. But here everything is simple. In itself, natural wood has an attractive pastel shade, which can be safely combined with almost all colors, including green. 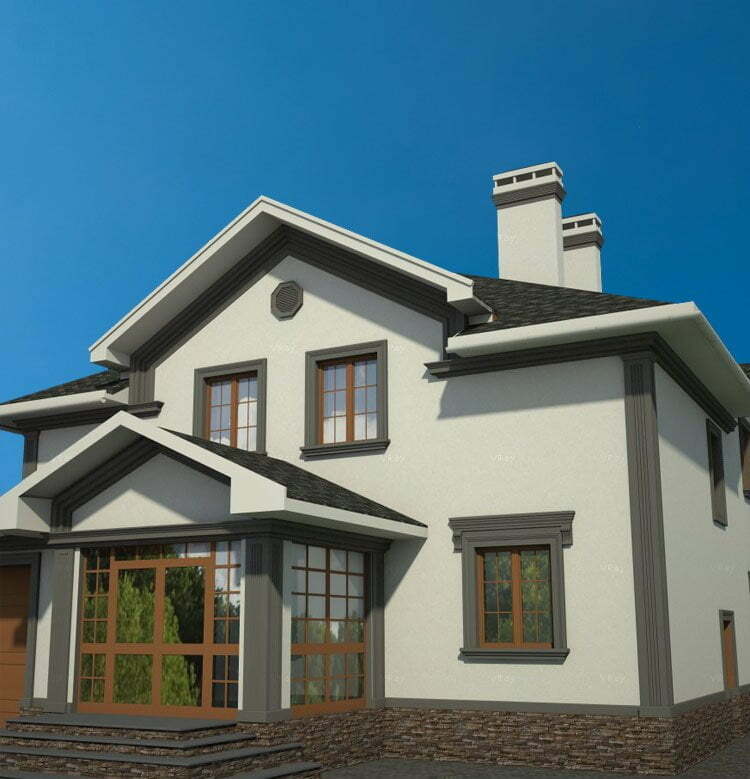 If, however, in the selection of the color palette, still there are difficulties, you can use the color selection of the roof and the walls of the house online. 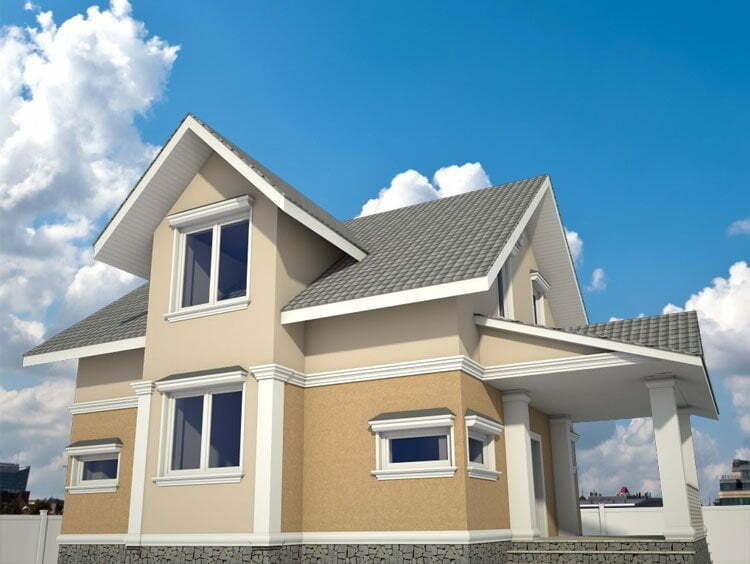 The process of building a house is surely completed by the stage of covering the roof and decorating the facade. 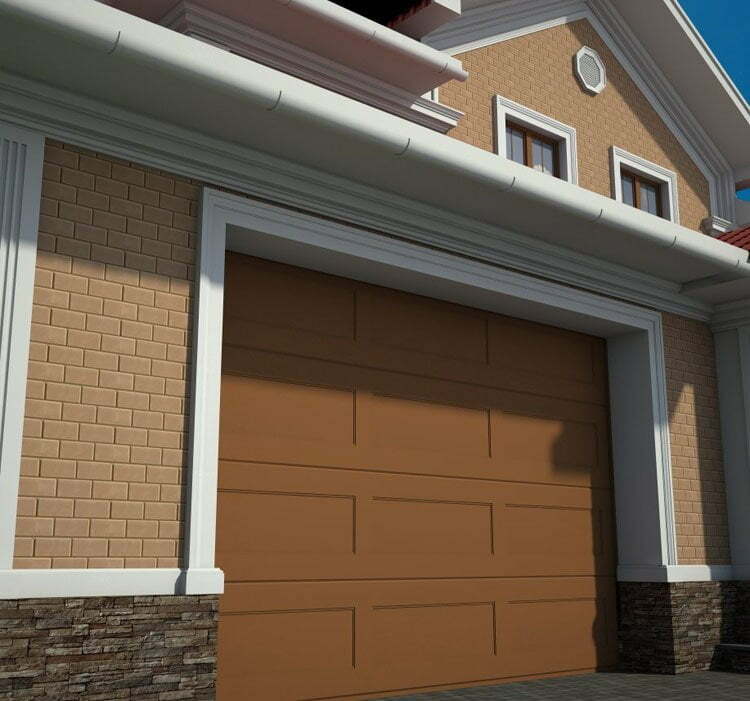 It is at this stage that it is necessary to exert maximum efforts to create the right color combination of the key elements of the exterior, because only in this way will the building have an aesthetic and attractive appearance. Doing it properly will be quite difficult even for those who have a refined taste. Often in this situation, the owners of the house turn to professional designers for help. But what are the experts guided by, creating color variations for the decoration of the house? The color solution for the exterior design of the building is a much more significant factor than we would imagine. Correctly using those or other colors, you can quietly hide some of the architectural defects of the house, as well as highlight its advantages. You can also change the visual perception of the shape or affect the degree of natural light, which is a particularly important factor during construction in latitudes where the climate is not moderate. 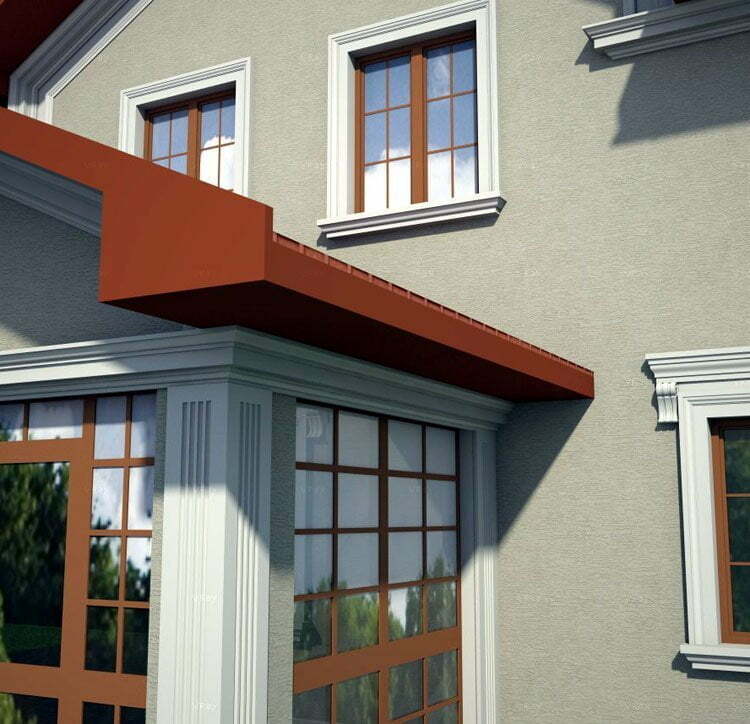 As we have already understood, choosing the color of the facade of the house will not be easy, but a large assortment of modern building materials will create even the most interesting color solution. 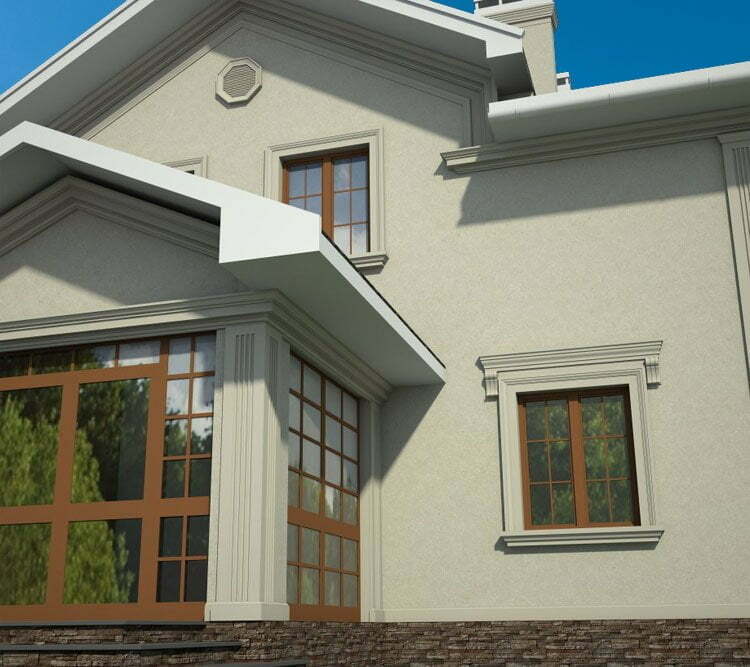 You can easily use the ready photo combination of colors of the facade of the house or choose the color of the facade of the house online, but to think about this problem yourself or with the participation of a specialist will become much more correct decision. 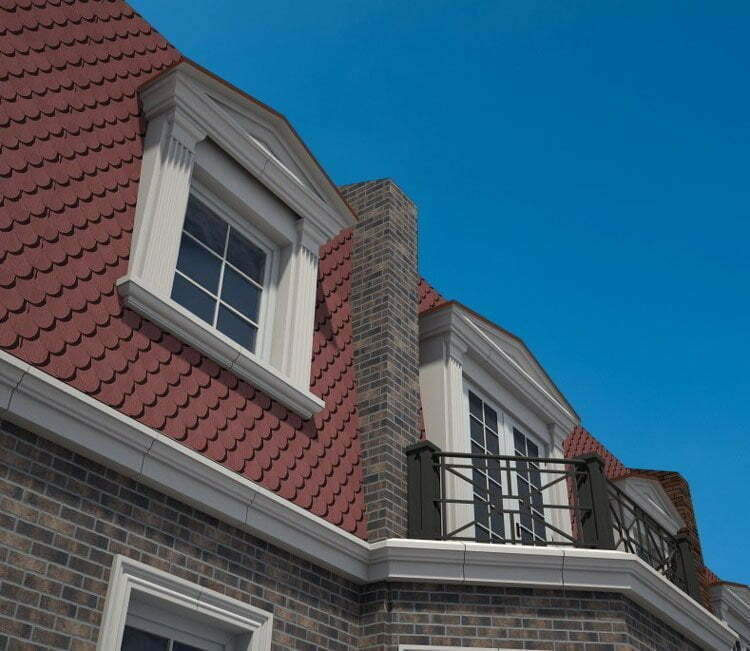 There are three standard ways of selecting a color combination for the facade and roof. In the first, the color of the walls of the facade merges with the color solution of the roof. This option is not the most correct, but sometimes occurs in exteriors. The second option is classic. It is a combination of a light façade and a dark roof. This option is one of the most acceptable. And, finally, the third option is a combination of a dark facade and a light roof. This choice will be the most original of the presented. 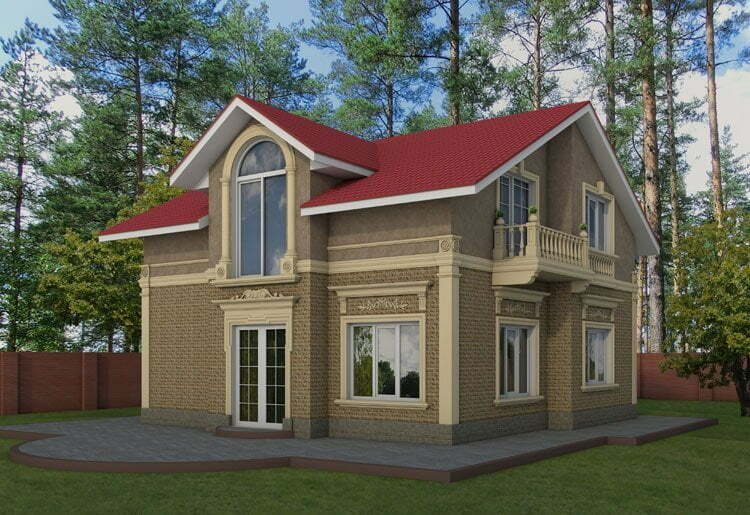 So, in what color should I paint the facade of the house with the red roof? According to psychologists, the red color in the design of both the interior and exterior is capable of actively boosting vitality, improving the level of brain activity and performance. The only thing that should be remembered: it should not be predominant, but serve as an addition to more calm shades. 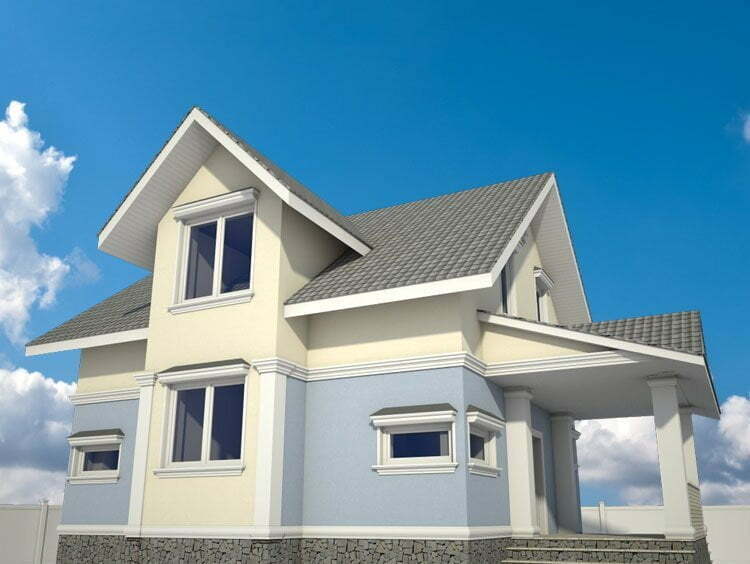 So, the red roof will ideally be combined with pastel colors, which will make the appearance of the house harmonious. This option is also suitable in the event that you are asking the question “What color roof to choose for a wooden house?”. The natural wood itself has pleasant and soft colors, which means it can balance the red color of the roof. 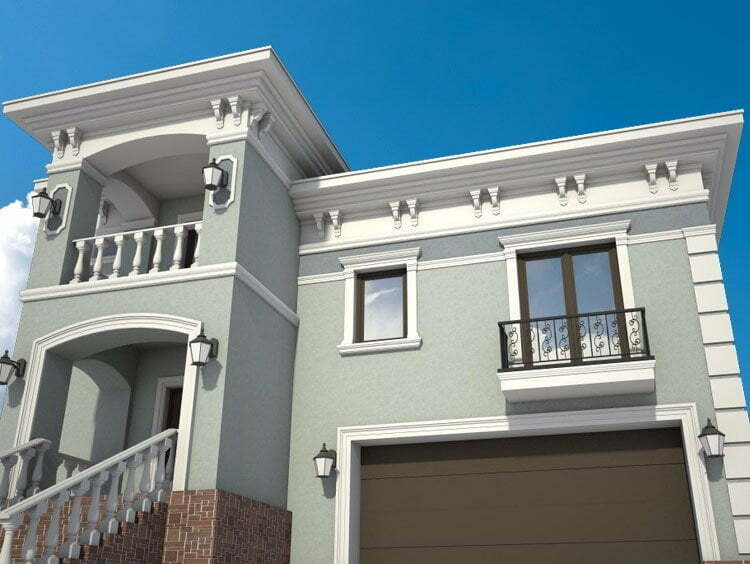 Although there are a lot of combinations of colors for painting the facade of the house, it should not be forgotten that the choice of the color for the facade depends primarily on the architectural style in which the building was built. The most common such styles are ethnic, classical, gothic, alpine and many others. 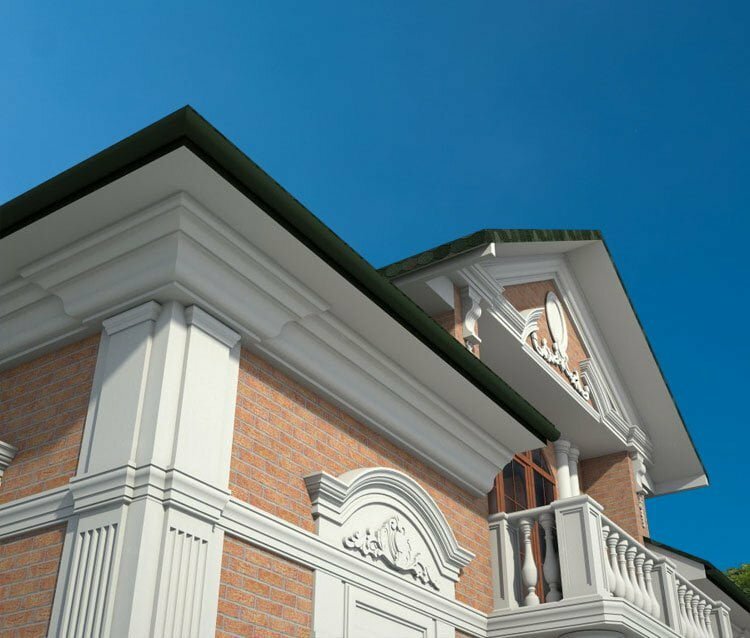 For those who are especially important that their house was made in an ideal styling, it is imperative to think about how to professionally choose a combination of colors for painting the facade of the house. Anyway, the choice of the appropriate colors depends on the owners themselves: someone, for example, needs to hide the building of the house among the surrounding trees, and someone, on the contrary, seeks to highlight it, emphasizing the individuality. 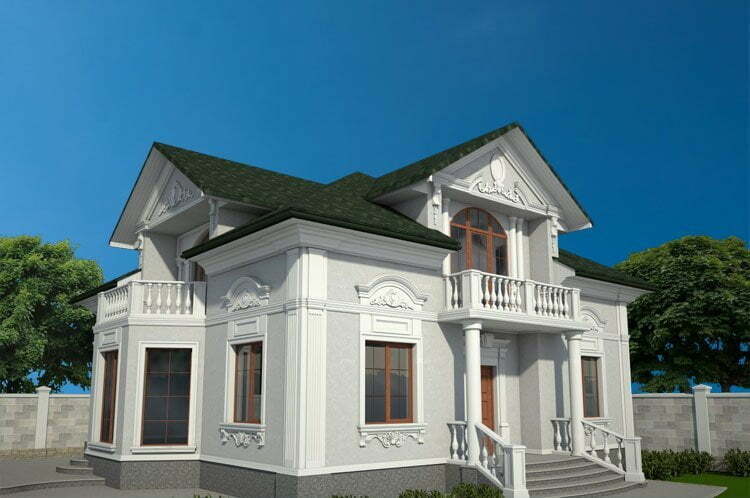 First of all, it is necessary to emphasize that the color solution of the roof is chosen, focusing mainly on the facade of the house. A classic and rather popular option is the combination of a dark roof with light walls. However, this option is only one of many. It is worth remembering a certain set of rules that must be adhered to in order to achieve an excellent visual effect that the building will acquire. 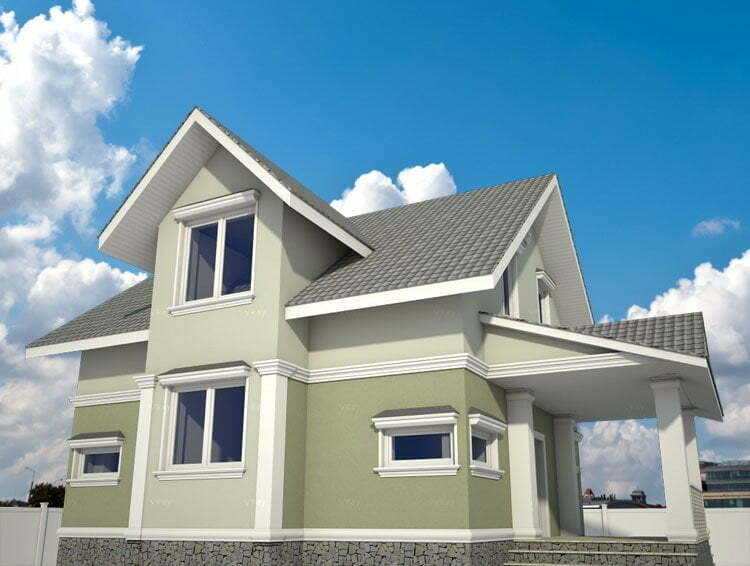 Firstly, the color of the roof should be correctly approached to other elements of the building. Secondly, it must necessarily be in harmony with the terrain. And, finally, the color of the roof should be combined with the architectural concept of the building as a whole. How to choose the color of the facade of a house with a gray roof? How many colors will be perceived together can be influenced by many factors, such as lighting and texture of materials. 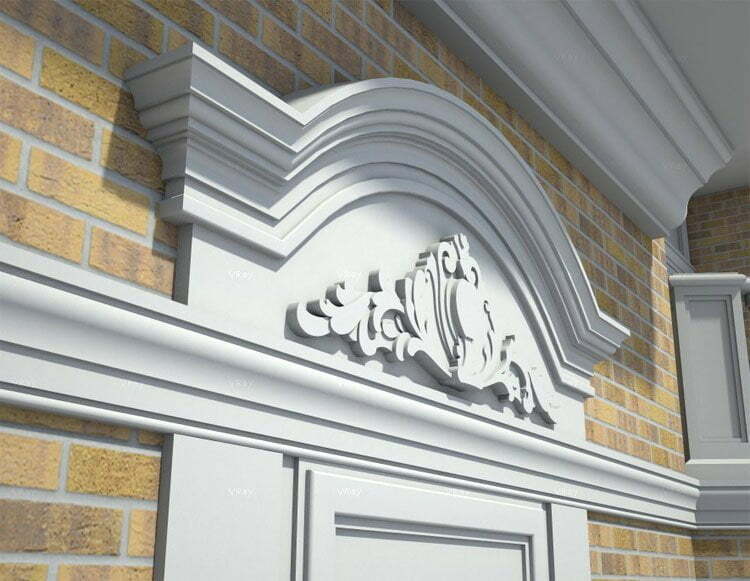 That is why before buying raw materials for the entire facade, you should make a test on a piece of the wall. 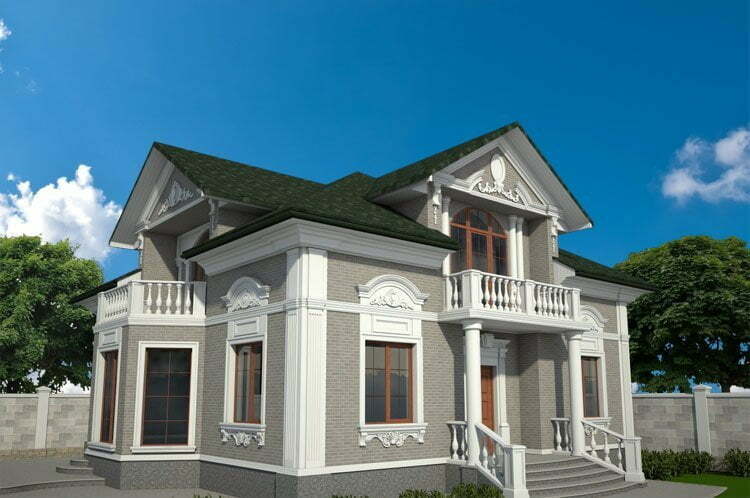 Pick the color of the facade of the house will be easy, if you know the characteristics of each color solution. Actively to use gray color in interior solutions has turned into a special fashion novelty. For a time it was thought that such a color was too gloomy and unworthy to be the main one. However, in fact, gray color can perfectly complement any interior, softening the effect of other colors in a necessary way. It can be safely assumed that such a color can be both basic and compatible with others. Of course, you can use the ready photo combination of colors of the facade of the house, but it will be more interesting to solve this issue on your own. 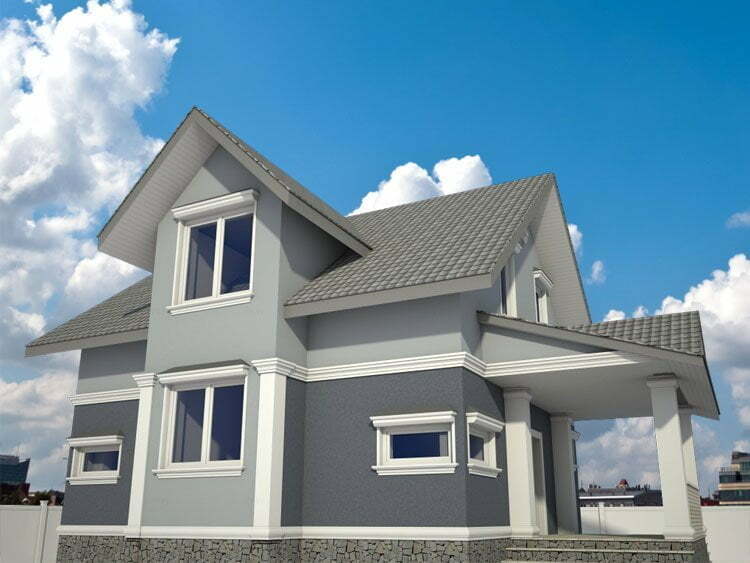 Thinking over what color to paint the facade of a house with a gray roof, we must not forget that similar shades perfectly complement each other. 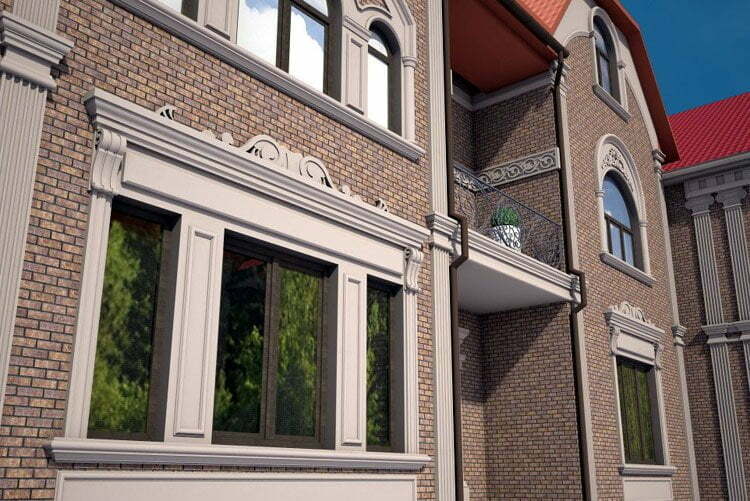 The classic look of the façade will give the use of natural colors. The fashionable colors of the facades of houses are also represented by pastel colors, the use of which carries less risks than the more intensive ones, because dark colors often become importunate, rather than more neutral ones. If you suddenly have doubts, what color solution to choose for a large surface of the facade among related flowers, you should choose the one that will become the least bright. In the photo, the colors of the facades of the houses show that it’s safe to create darker and more daring colors on small surfaces or combining them with light tones. 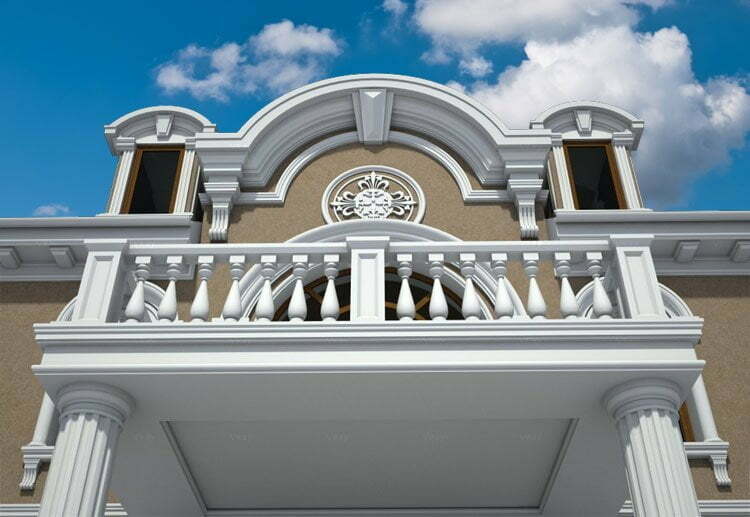 It is necessary to remember that using various combinations of colors for painting the facade of the house, you thereby make it more diverse and add some originality. In this case, the right decision will be limited to a few colors, since the use of many colors can create a negative feeling. The lining of the facades of the house is due to a variety of materials, giving the building a more natural and refined color. 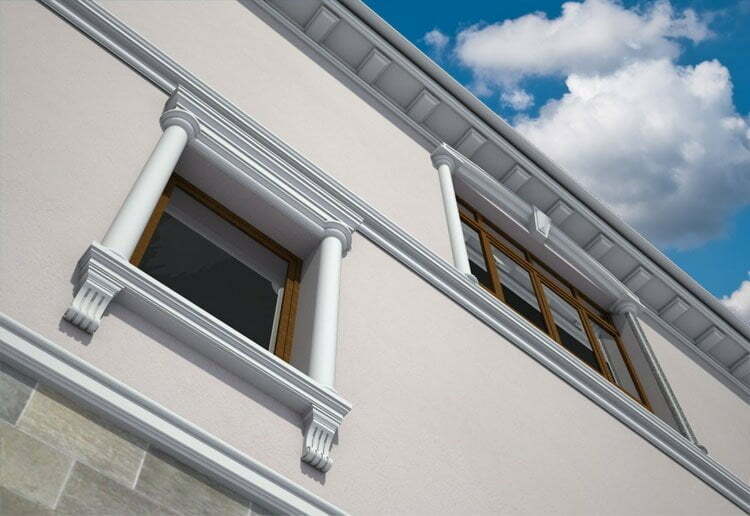 Whether it’s stone, wood, brick or plaster – all these materials or their combinations can change the appearance of the whole building beyond recognition. 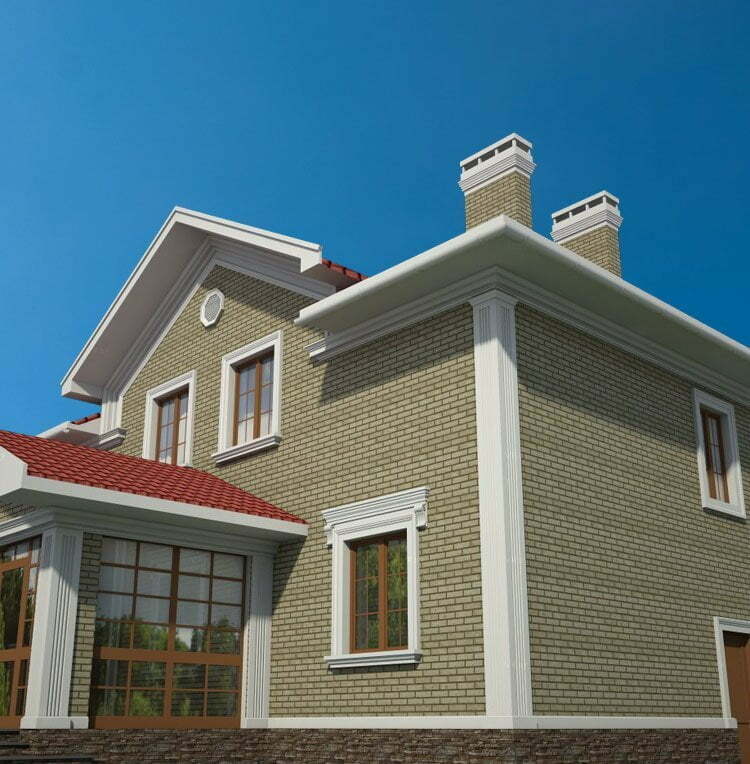 To choose the color of the facade of the house, it is necessary to take into account a whole range of factors, such as climate, territorial location, technical features, purpose of the building, dimensions, type of finishing materials, structural elements and so on. It is important to remember that the right combination of shades helps to create high-quality architectural ensembles that are impressive with their beauty. 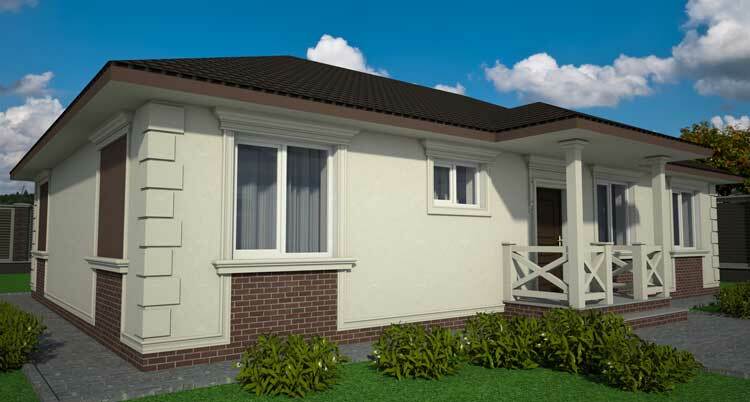 Aboriginal question: in what color should the facade of the house be painted? 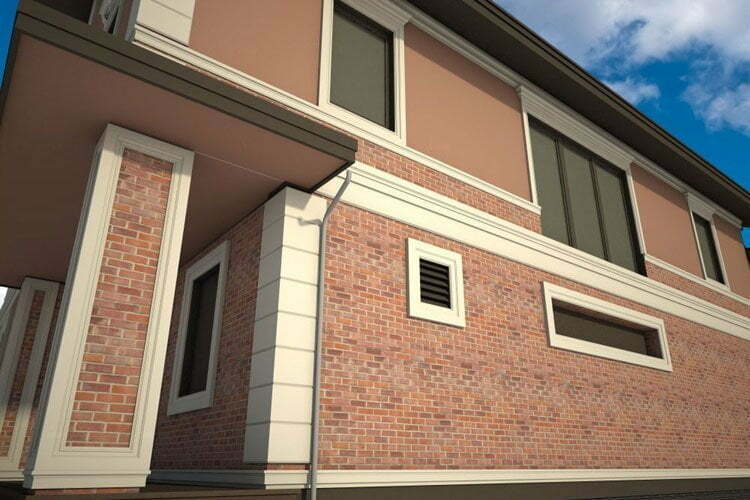 Choosing a color solution for the facade, you need to follow a few simple rules. First, lighter tones are preferable to bright and saturated analogues. Secondly, shades that have come from the same color are perfectly combined with each other. 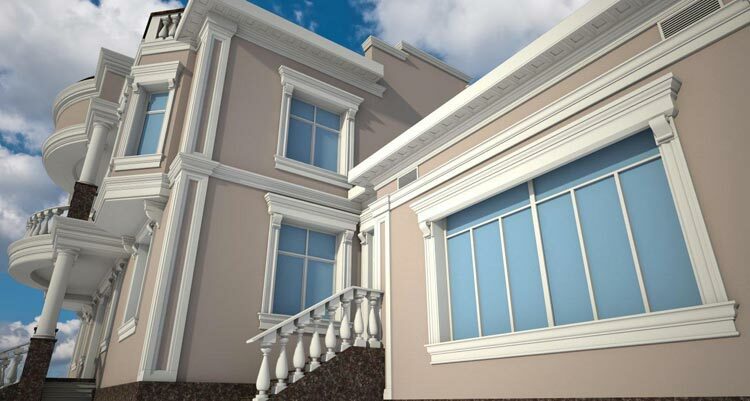 To achieve a classic view of the building, you must choose natural colors. Thus, correctly combined color palette will give the house a special individuality and originality. If you look closely at the photo, the combination of the color of the facade of the house can be done in great variation. So, for painting walls often use warm colors, among which are brown, red and orange. A combination of white and gray shades is popular. It is important to remember that using such colors is necessary in limited quantities, because abuse can make the appearance of the house absolutely insipid. 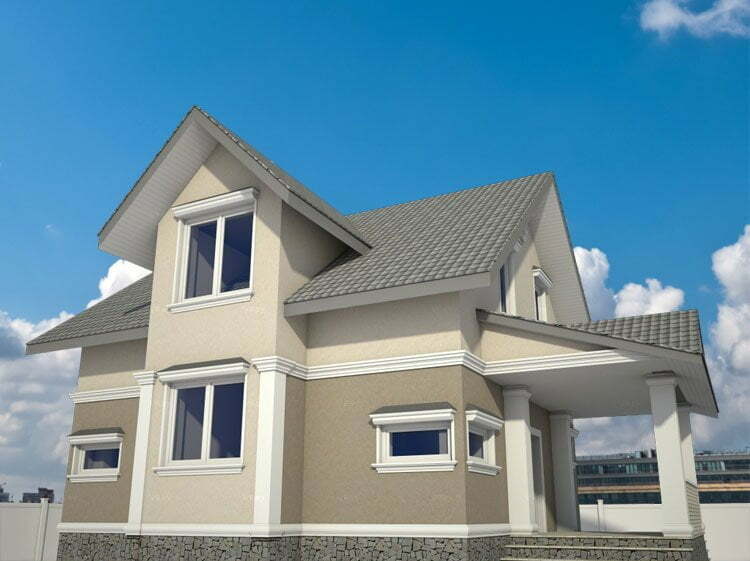 The appearance of the house should be attractive and accurate, and bright color solutions specifically distinguish the structure from the landscape and visually add the size of the building itself. The white color of the facade can be easily combined with other interesting shades. 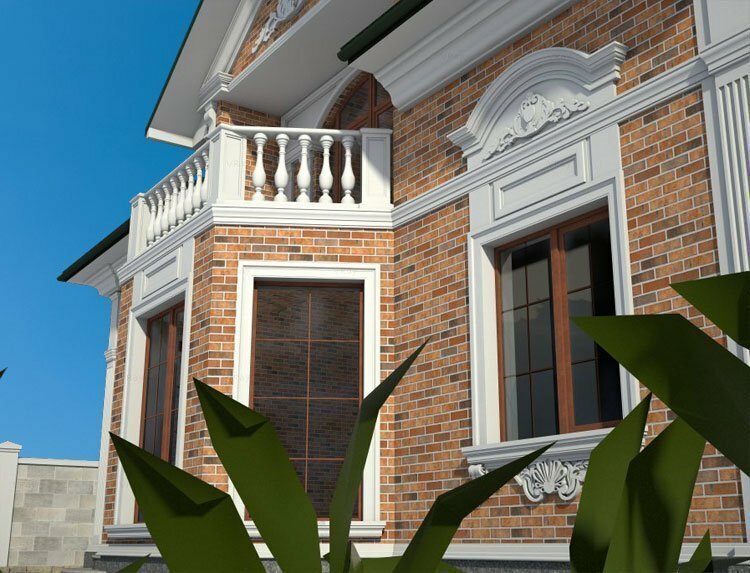 Among the fashionable colors of the facades of houses is a green one, which is perfectly combined with the environment. 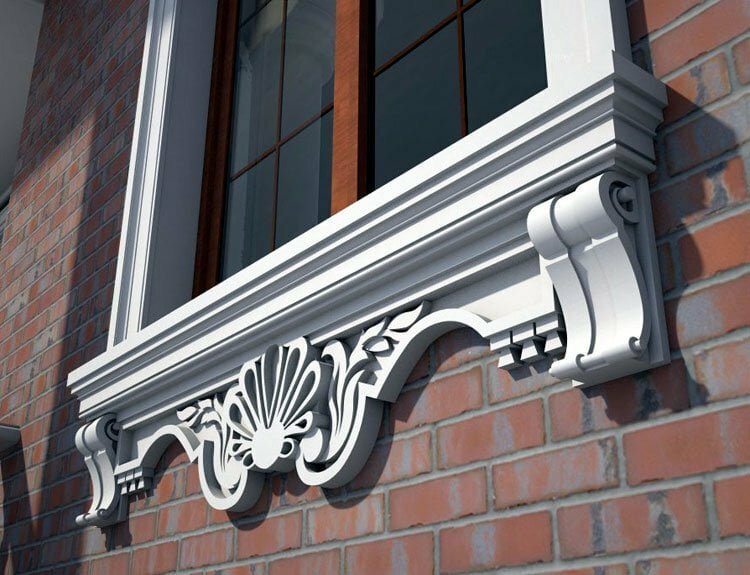 It is often used for finishing the facades of large mansions or country cottages. In addition, modern architecture allows the use of violet and even black color solutions. An interesting choice for the decoration of the facade is certainly the now popular pistachio color. 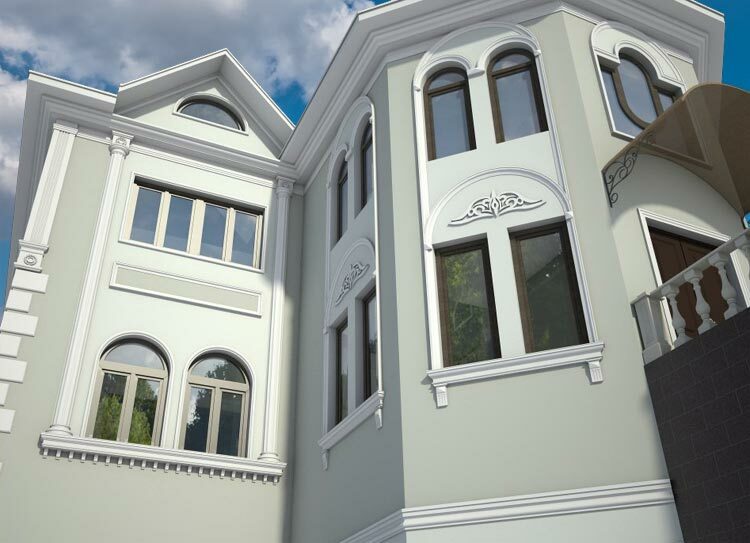 Being bright and at the same time refreshing, pistachio color of the facade of the house color will help to fill the soul with joy and will certainly cheer up. 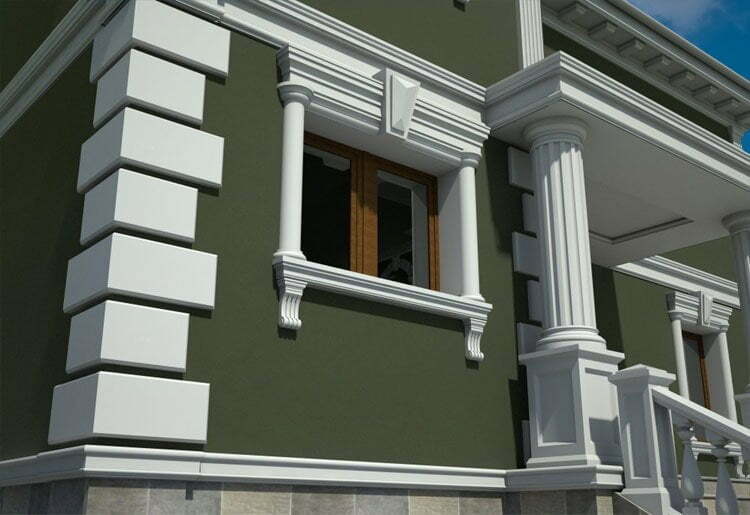 The energy and lightness that the pistachio color possesses will not leave you indifferent, which is why it will look great on the facade of the building. 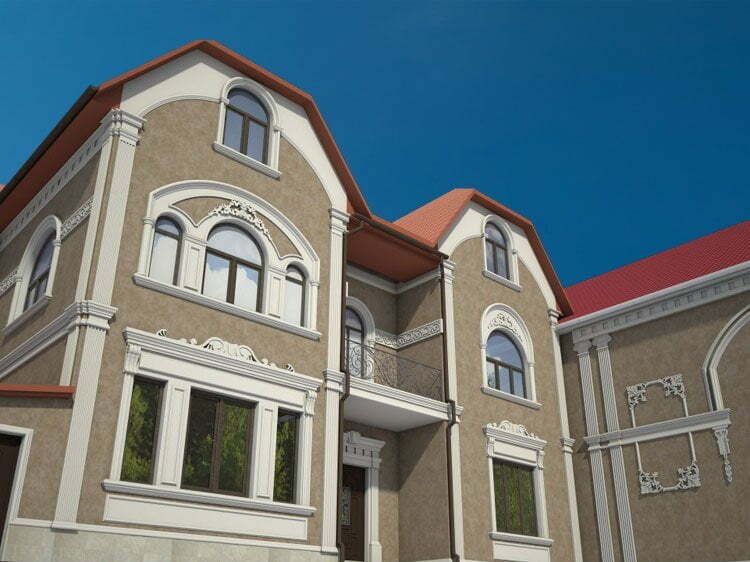 If you look at the Internet photo of the color of the facades of the houses, you can understand that a good choice for decoration will also be terracotta, which is modern and at the same time awakens a sense of calmness. Such design can be made both from bright shades, and softer. It is important to remember that the peculiarities of the building itself are determined by the combination of colors, because an incorrectly chosen color palette can spoil all the charm of architecture. It is necessary to take into account the texture of materials and the size of individual parts of the facade. A smooth texture can increase the brightness, the rough texture will certainly soften the colors. 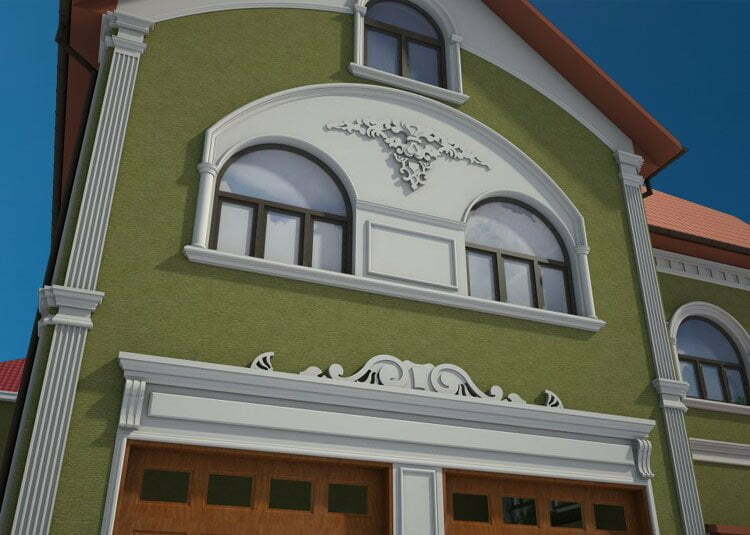 Picking up the color scheme for the facade, you need to take care also to properly select all of its elements – doors, roof, windows.